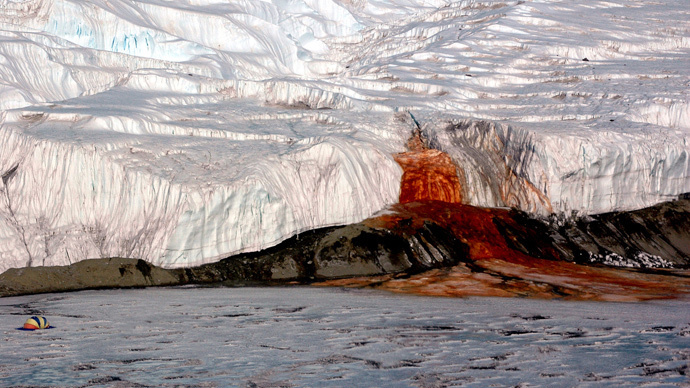 Antarctica's Blood Falls could be home to microorganisms similar to alien life on Mars. New data shows that beneath McMurdo Dry Valleys, earth’s coldest and driest place, lies salty water that may support previously unknown ecosystems. This region is best known for the eerie Blood Falls, an outflow of an iron oxide-tainted plume of saltwater. Scientists previously thought that red algae gave this bloody ooze its dramatic color, but later it was proven to be due only to iron oxides. Scientists have discovered that brines (salt solutions) form extensive aquifers below glaciers, lakes and within permanently frozen soil. According to the National Science Foundation (NSF), the brines may also play a major role in modern biological processes in the Dry Valleys, named so because of their extremely low humidity as well as lack of snow or ice cover. "These unfrozen materials appear to be relics of past surface ecosystems and our findings provide compelling evidence that they now provide deep subsurface habitats for microbial life despite extreme environmental conditions," the study's lead author, Jill Mikucki, an assistant professor of microbiology at the University of Tennessee, was quoted as saying. It's hoped that the new data might shed light on whether similar conditions exist elsewhere in the solar system. The Dry valleys ecosystem - home only to microscopic animal and plant life - closely resembles, during the Antarctic summer, conditions on the surface of Mars. "Over billions of years of evolution, microbes seem to have adapted to conditions in almost all surface and near-surface environments on Earth. Tiny pore spaces filled with hyper-saline brine staying liquid down to -15 Celsius may pose one of the greatest challenges to microbes," a glaciologist and coauthor at the University of California, Slawek Tulaczyk, said. According to Tulaczyk, the electromagnetic data gathered by researchers indicates that "margins of Antarctica may shelter a vast microbial habitat, in which limits of life are tested by difficult physical and chemical conditions." The team also found evidence that brines flow towards the Antarctic coast from roughly 18 kilometers inland, eventually discharging into the Southern Ocean, a biologically rich body of water that encircles Antarctica. Researchers think it's possible that nutrients from microbial weathering in those deep brines affect near-shore biological productivity in the ocean. Meanwhile, the vast majority of Antarctica's coastal margins remain unexplored. Researchers managed to gather their groundbreaking data using a novel, helicopter-borne electromagnetic sensor, developed in Denmark, to penetrate the surface of large swathes of terrain. The project took many years of developing the best mapping technology in the world. The results shed new light on the history and evolution of the Dry Valley landscape, which during the height of the southern summer has free flowing rivers and streams.